A 7.3-magnitude earthquake struck Sunday about 30 miles under the Molucca Sea in northeastern Indonesia, damaging a church and injuring three people, the U.S. Geological Survey said. 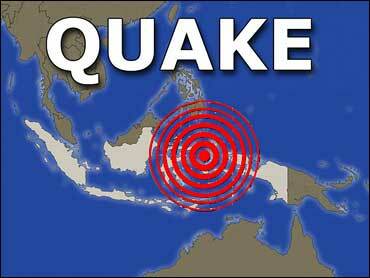 The epicenter of the major quake was about 80 miles from the city of Ternate, in north eastern Indonesia, it said. It had a depth of more than six miles below the ocean floor. An official with the Pacific Tsunami Warning Center in Hawaii told The Associated Press that a basin-wide tsunami — one that travels a great distance or across an ocean — isn't expected, though a tsunami near the earthquake's site is "always possible." "Given the size of the earthquake, we think a basin-wide tsunami isn't likely, though a local tsunami could be possible," said Brian Shiro, a geophysicist at the tsunami center. Indonesia, the world's largest archipelago, is prone to seismic upheaval due to its location on the so-called Pacific "Ring of Fire," an arc of volcanos and fault lines encircling the Pacific Basin. In December 2004, a massive earthquake struck off Indonesia's Sumatra island and triggered a tsunami that killed more than 230,000 lives — 131,000 people in Indonesia's Aceh province alone. Akpinar said. Two people were slightly injured. The quake, with a preliminary magnitude of 5.0, was centered in the town of Tutak, in Agri province, which borders Iran, the Istanbul-based Kandilli Observatory said. It struck at 9:38 a.m.
Derya Ozer, the daughter of the local administrator in Cobanova, said some old houses and barns came down in the temblor, while others had suffered cracks or other types of damage. "But thank God there is nothing serious," she told CNN-Turk television. "Everyone is waiting outside. Nobody will go back into their homes." The tremor also caused a power outage in the village, she said. The quake was felt in several areas around Agri and sent residents running out of their homes in panic, Akpinar said. Earthquakes are frequent in Turkey, which lies on active fault lines. Two devastating earthquakes hit northwestern Turkey in 1999, killing some 18,000 people.